Early in the morning, “joy” lingers at the door and howls longingly to come in. I can’t resist. I crack the door, and he slips through eagerly. I settle on my chair, and he nestles his silky head on my lap. His front paws creep up to join his head. He lifts his lanky back legs, and 65 pounds on stilts hovers awkwardly over me. Then he folds into a compact curl. I stoke his velvety fur, and peace settles deep in my bones. “Bently” ran his heart out last October in Florida. In fact, he literally ran his leg out. He pushed himself to intensely high speeds and fractured a bone mid-race. His promising career cracked to a halt. When we first met him, the intensity of his eyes seemed to still hold the passion and tragedy of that last run. He struggled to make eye contact; and I did too. His eyes frightened me a little, orange and fierce like a blazing fire. Before we even met him, I pursued him on a hunch, an intuitive sense that an all-black dog belonged with us. 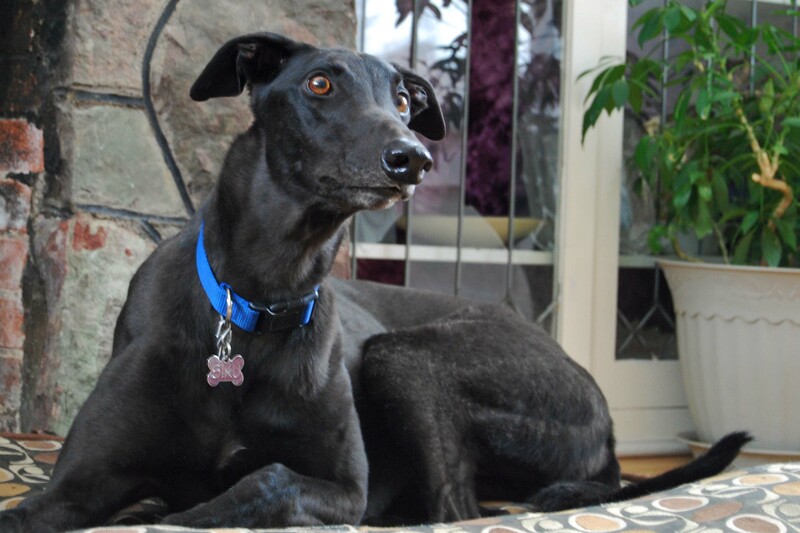 When an email from Colorado Greyhound Adoption (CGA) landed in my in-box describing him, sent to us along with other potential foster homes, I threw our name in the hat. But our first foster dog, Felix, found his final home a day too late; and “Bently” was placed with another family. Then we were asked to care for Romeo, in need of emergency foster placement. I emailed CGA to let them know we were interested in adopting “Bently.” He was put on medical hold as his fractured leg healed. I saw a photo of him on Facebook, posted by his foster mom: pure black, all the way down to his toe nails. I emailed CGA again and asked if we could take over his foster care. 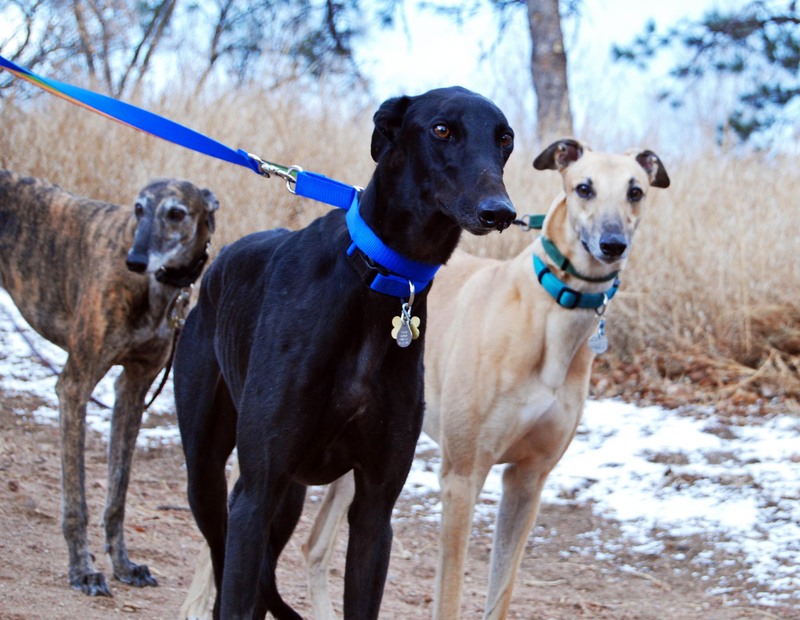 Within a few days, arrangements were made, and three gangly greyhounds over-flowed our home. Siku also realized he liked the couch. I found this helpful advice on the internet, “Place pieces of aluminum foil on top of your pet’s favorite hangout spots. They find the constant rustling-sound of aluminum foil to be so disturbing that they may choose to avoid that spot altogether, due to unfavorable association alone.” Carefully, I spread the foil and left the room. Siku took it off and shredded it. Yes, he was definitely disturbed by the sound…. So he got rid of it. I came back to discover little foil bits deposited on his own bed, and Siku proudly perched on the couch. We’ve fallen in love with each other. His orange eyes meet mine with soft glow of affection. My favorite moments with him are those early morning prayer times. Stroking his velvety black fur, I cling to the promise of coming joy. Particularly in this season of navigating a beloved family member’s mental illness, he is tangible reminder of invisible truth. After all, if God can use a donkey to warn a prophet, is it too much for Him to create a dog as visible prophecy of joy? And what a beautiful dog. Our daughter’s doctor actually prescribed a dog when our daughter became ill. Her name is Lucy (a Patterdale Terrier…a rescue dog we adopted) and she has been a Godsend. your prayer and support has meant the world, megan! i agree jody! i feel that way about most of your posts!